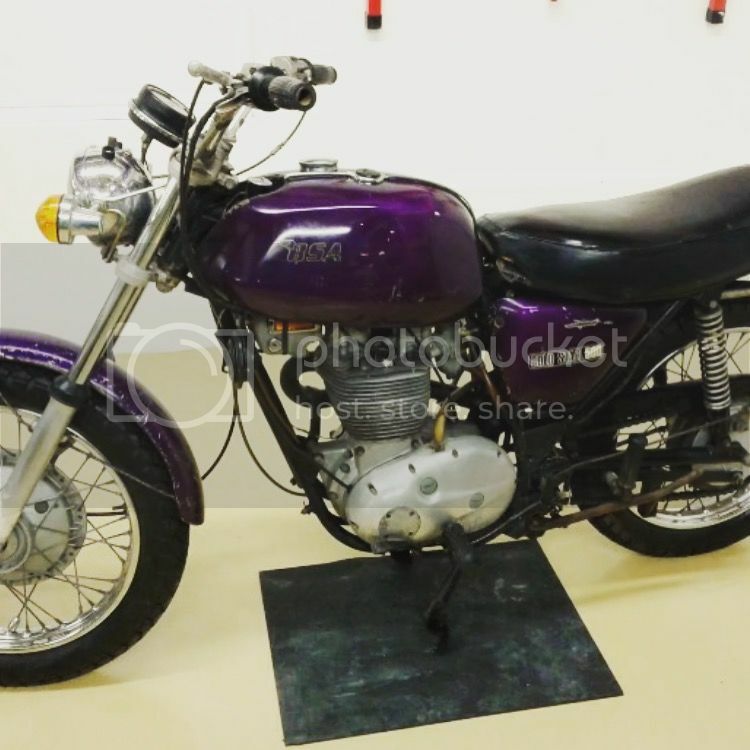 Anyone have a purple front fender? Bought a 72 b50ss but the front fender is in bad shape. You can't see it in the picture but the front has a bunch of rust and welding where the little support rod was welded on after breaking. Thanks! Just wanted to check back in. Any fenders out there? Any one got a link to where to get the same front fender from as I also need one for my B25ss Goldstar I have seen some from later triumphs and bsa models but the wire stays are not correct am looking to complete an original UK spec Bike so a correct one would be good..any help would be good. You are correct, the early mudguards did not have that vertical stay. BUT there is in 72 a BSA Service Sheet suggested they should be modified (because they broke), either by fitting a special clamp (97-4436) which had an additional strip welded to it that bolted to the mudguard (my had this mod done when I bought it) or by fitting the later mudguard. Service Sheet 11/72 can be found here. You could always grind off the vertical stay....Whatever you get, be aware that the (trumpet) disc model mudguards are wider and if fitted to a comical hub, push the mudguard out too far and it just looks wrong (as per my ). if you have a good un modded mudguard for the B25ss and are in cornwall can you stick it in your suitcase and we will have a a deal...any photos etc ..pm me and we can discuss how many shillings you will need to dispose of yours to a good cause. What type of mod? Thanks!